As parents, grandparents and teachers, we want kids to be proud of speaking two languages. We want them to see bilingualism as a part of their identity. One excellent way to send this message to kids is with the fun collection of Spanish t-shirts (and t-shirts about speaking Spanish) by Ellie Elote. Supportive environments help young Spanish speakers and Spanish learners embrace the language and feel proud of their ability to communicate. Parents and teachers make an effort to support bilingualism at home and at school, but it is always nice to have a little help. 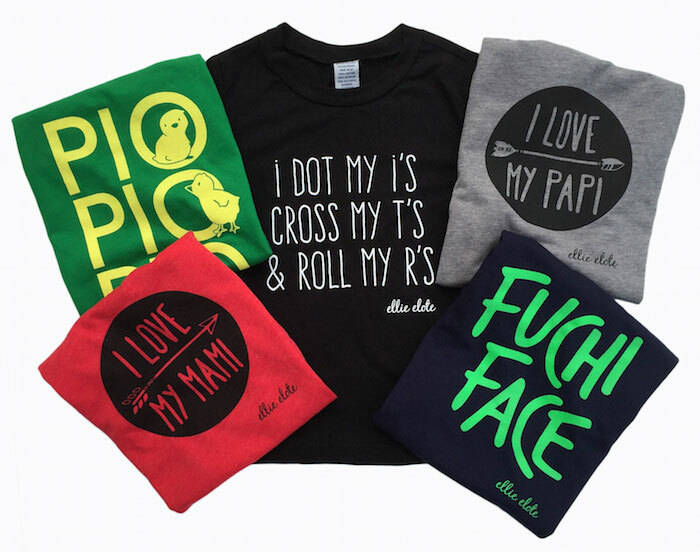 Ellie Elote celebrates bilingualism with a line of Spanglish and Spanish t-shirts for kids. 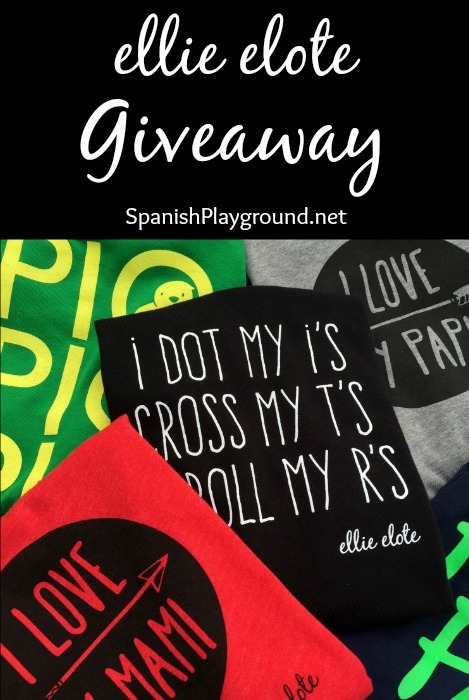 Ellie Elote has a giveaway for Spanish Playground readers! They are giving away any in-stock t-shirt of the winner’s choosing (long or short sleeved), including domestic shipping. Enter the giveaway using the Rafflecopter below. Read Spanish Playground’s official giveaway rules. Aren’t these Spanglish and Spanish t-shirts darling? They let children know that we value their Spanish skills. The Spanish t-shirts also let others know that our kids speak Spanish! People will see these t-shirts and engage the kids in conversation. When they do, children are reminded of the fun and importance of speaking Spanish. Ellie Elote isn’t only about cute clothes for kids. This socially responsible company donates a portion of every purchase to Mayan Families’ Well Mother, Well Baby Program. You can follow Ellie Elote on Instagram, Twitter and Facebook. I’ve been eyeing the I love my Papi tee for a while now. 🙂 It would make a great stocking stuffer. These are such fun T-shirts! We are a bilingual family!! I would love to win !! These shirts are great! I hope I win. My Daughters’ Abuelo would be thrilled to see them in the Pio Pio Pio shirt since he’s been singing it to them since they were babies! Too cute!